Exceptionally juicy and deliciously tropical, pineapples tickle the taste buds with a balance of sweet and sharp notes. Eaten fresh, they’re a reminder of summer and sunshine – what better reason do you need to tuck in? Pineapples are not, strictly speaking, one fruit. Rather they are tiny ‘fruitlets’ all fused together, resembling a pine cone, which is how they got their name. Once seen as a rare, exotic fruit but now readily available, these spiky-skinned treats conceal golden treasure, which more than justifies the small amount of preparation required – a special tool like our Pineapple Slicer & Wedger can quickly remove the juicy yellow flesh and fibrous core, and the shell can even be used to serve sorbets or cocktails. When selecting a pineapple, follow your nose – a ripe fruit will have a sweet, fragrant smell and yield to the touch slightly, while soft spots mean it’s past its best. However ripe fruits don’t store well, so should be eaten within a few days of buying. 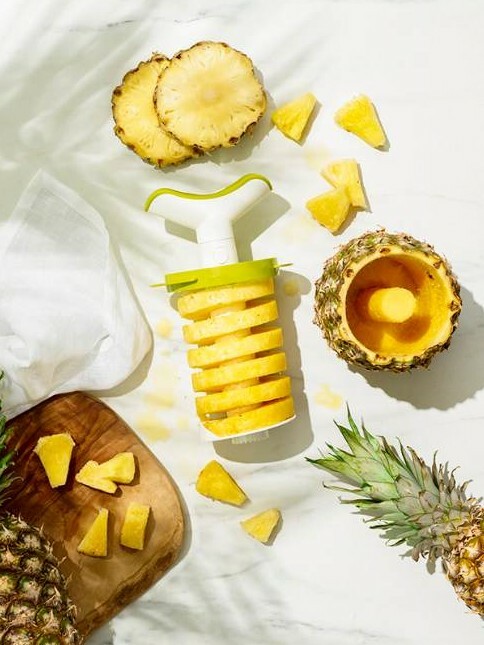 It can take up to 3 years for a pineapple to mature, which means they’re sometimes pricey, but they’re bursting with vitamin C and manganese which helps with energy production, and also contain bromelain, an enzyme which breaks down protein and is thought to aid digestion. And although very sweet, the soluble fibre they contain slows down the rate that sugar is digested. It’s a golden goodie as far as we’re concerned! We’re all familiar with pineapple upside-down cake and grilled rings on a gammon steak, but the use of pineapple in cooking has come a long way since the ‘bits on sticks’ of yesteryear. Its vibrant flavour is a fantastic addition to spicy pork burgers and makes a fruity foundation for chutney, especially when partnered with red onions, chillies and lime. We think it’s an enticing addition to sweet and savoury dishes alike – try our taste-of-the-tropics recipes and we’re sure you will too!